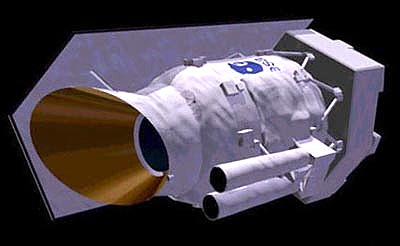 ISO (Infrared Space Observatory) was a infrared space telescope designed and operated by the European Space Agency (ESA), in cooperation with ISAS and NASA. ISO was designed to study infrared light at wavelengths of 2.5 to 240 micrometers to provide detailed infrared properties of selected Galactic and extragalactic sources. The sensitivity of the telescopic system was about one thousand times superior to that of the Infrared Astronomical Satellite (IRAS), since the ISO telescope enables integration of infrared flux from a source for several hours. Density waves in the interstellar medium, its role in star formation, the giant planets, asteroids, and comets of the solar system are among the objects of investigation. The telescope has a Ritchey-Chretien configuration, with an aperture of 60 cm and an overall f-ratio of 15. The primary and secondary mirrors are made of fused silica. The field of view of the telescope is 20 arc-min and the pointing accuracy is 5 arc-s. The collected flux in the wavelength range of 2-120 micrometers is channeled to one of the four detecting instruments, as desired. The cryostat of the payload module surrounded the telescope and science instrument with a large dewar containing a toroidal tank loaded with 2268 litres of superfluid helium. Cooling by slow evaporation of the helium kept the temperature of the telescope below 3.4 K and the science instruments below 1.9 K.
Infrared Camera (ISOCAM) - A high-resolution camera covering 2.5 to 17 micrometer wavelength with two different detectors. Short Wave Spectrometer (SWS) - A spectrometer covering the 2.4 to 45 micrometer wavelength to provide information about the chemical composition, density and temperature of the universe. Long Wave Spectrometer (LWS) - A Spectrometer covering the 45 to 196.8 micrometer wavelengthto provide information about the chemical composition, density and temperature of much cooler objects than the SWS. Particularly cold dust clouds between stars were studied with this instrument. ISO was operated from an highly excentric 24 hour orbit. All data, both science data and housekeeping data were transmitted to the ground in real-time. The operating lifetime of the observatory was designed for 18 months. On 8 April 1998 the load of superfluid helium coolant had depleted and science observations were ceased. A few detectors in the SWS instrument were capable of making observations at higher temperatures and remained in use for another 150 hours to make detailed measurements of an additional 300 stars. In the month following depletion of coolant the 'Technology Test Phase' (TTP) was initiated to test several elements of the satellite in off-nominal conditions. After completion of TTP, the perigee of ISO's orbit was lowered sufficiently enough to ensure ISO will burn up in Earth's atmosphere in 20 to 30 years after shutdown. ISO was permantly switched off on 16 May 1998.